Join us every first Thursday of the month for The Nashville Canon Revue, poetry and short story readings hosted by Maxwell Putnam. 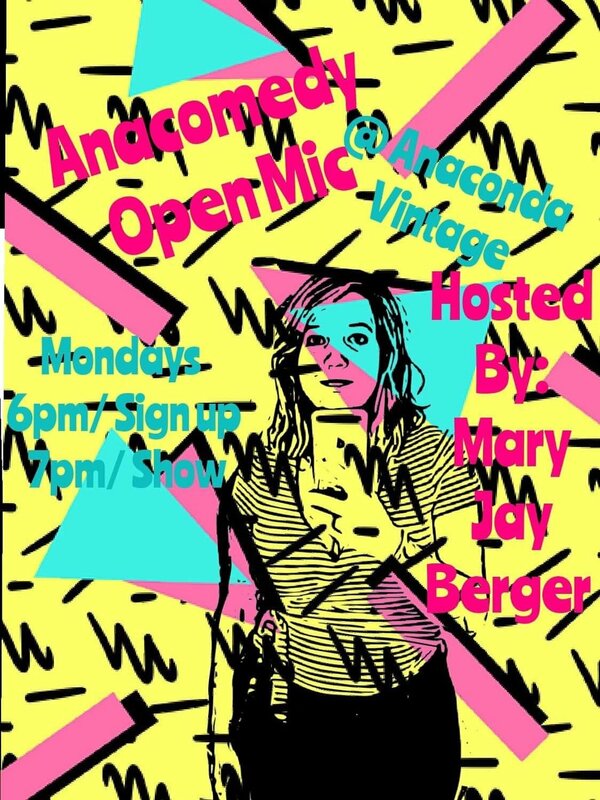 Mary Jay Berger, local comedian, hosts Nashville's first all ages comedy open mic on Monday nights. Sign up starts every Monday @ 6pm! Stop by the shop on Saturday, Oct 27th from 1-4 and donate gently used adult halloween costumes and accessories & swap them out for a new-to-you costume! Then, come inside to experience a tarot card reading by East Nashville's own Holy Rose. PLUS tons of in-store giveaways, hot apple cider, kids' trick or treating and much more. Anaconda Vintage, Grimey's & Eastside Music Supply are hosting a Music Gear Swap October 20th from 12-4. Pull up your car, pop your trunk, display your gear + sell, swap, or buy items with other musicians. A few tables will be available for those without cars + we will have one source of electricity provided to sellers by the store. Bring anything gear related including guitars, basses, keyboards, band instruments, pedals, amps, PA, recording gear, drums, percussion, and more! Please Vote Nashville presents a live poetry reading from Daniel Lucca Pujol + Luke Schneider on pedal steel plus readings from Ciona Rouse and Robyn Hitchcock. Come to the show and enjoy live music from Emily Clement, Greyson Anderson + Alexandra Gavigan. Last Saturday of August, bring 10 of your favorite clothing items that you don't wear anymore and swap for 10 'new to you' pieces of clothing that other folks have brought in. Our vendors also stock the tables with their giveaways. Mark your calendar, we are hosting a red dot sale starting August 25th. Everything in the store marked with a red dot on the tag is 20% off! There are currently 100 million pieces of litter on TN's state roadways and it costs $15 million of TN taxpayer money to clean it up every year. Take an hour out of your day to help combat TN's litter problem, and afterwards you will be rewarded with coffee, snacks, and 10% off the entire store!